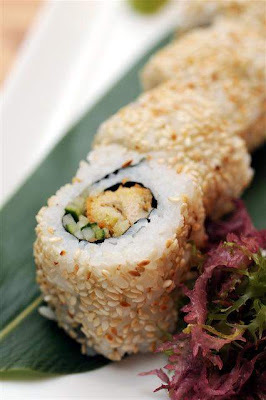 One of the biggest thrills of travelling have to be the joys of discovering new food. That was exactly what happened when hubby hopped over to the Lion City following a recent business trip down south. 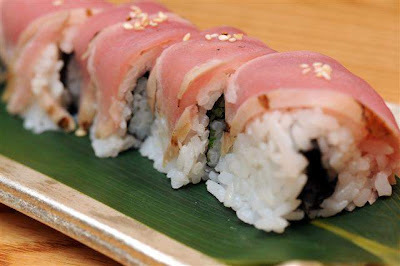 His interesting finds include these pillow-soft rolls and imported Japanese seaweed that looks remarkably like tiny strands of sparkling beads. 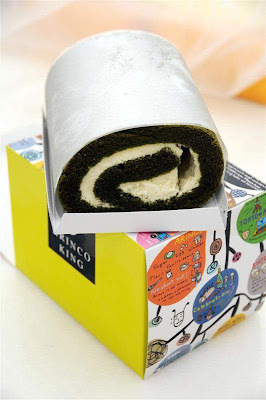 I love the colourful box with arty renderings on the Matcha Roll! The simpler one is for the Salt Caramel Roll. 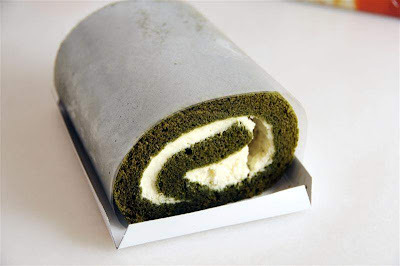 The Matcha Roll which was redolent with the unmistakable and intense flavour of Japanese green tea had generous lashings of fresh whipped cream in it. 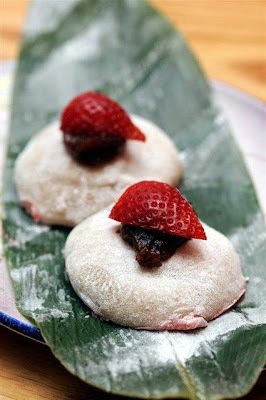 Its subtle sweetness certainly help to temper and balance the cake's astringent tea accent. 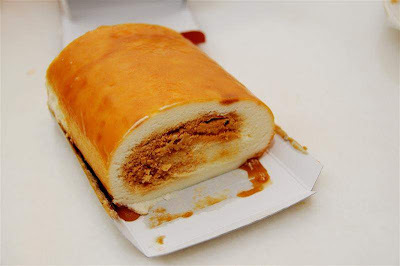 The Salt Caramel Roll is such a big hit that our Singapore friends actually called to reserve it for us! 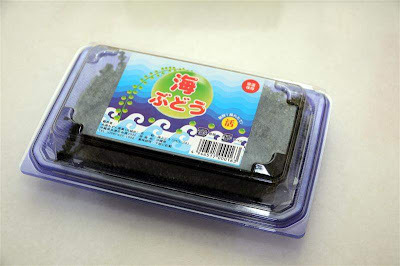 What makes this treat so distinctive is its super-soft texture and light coating of briny caramel on the outside and mixed with its fresh cream filling. Its taste reminded me somewhat of peanut butter though its viscuosity is much lighter. 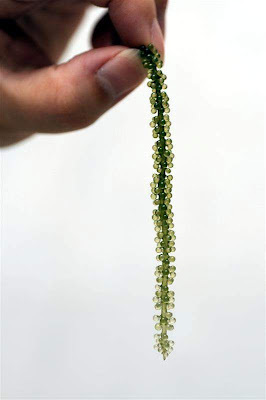 We also love the unusual seaweed that resembled delicate strands of tiny glass beads. 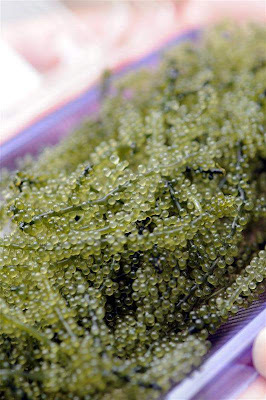 Crunchy with a mildly salty flavour once you bite into the minute pearls, their texture is akin to that of salmon roe with a barest hint of the sea. 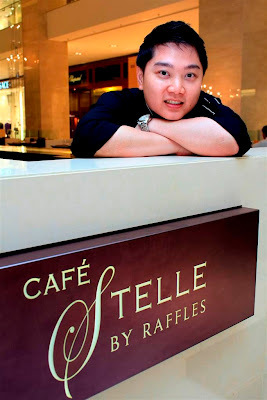 For the ladies of leisure who frequent the Couture Pavilion precinct of Pavilion Kuala Lumpur, Cafe Stelle is a godsend. With a 40-metre elevated fashion runway down its centre aisle, this tranquil haven is perfect for a cosy tete-a-tete or merely to refresh and rejuvenate after a bout of retail therapy. Husbands and beaus who sometimes are roped in as unofficial bag carriers will also find welcome respite from the labourious task of following their other halves around. An outlet managed by the international Raffles Hotels & Resorts company, Café Stelle exudes modern chic with a stylish environ that abounds with natural wood and metallic finishes, neutral hues and streamlined furnishings. Aside from formal table seating, patrons can loll around comfortably in cosy ottomans and lounge settees. 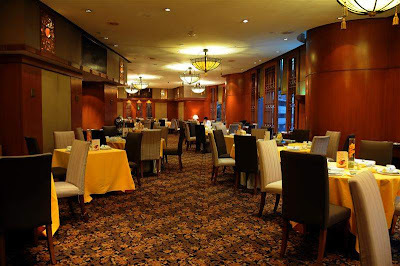 The word 'stelle' which stands for 'stars' in Italian is a tribute to the very spot where the Pavilion KL and hence the cafe is sited - Bukit Bintang - a thriving commercial hot spot which means Star Hill in Malay. The cafe's Italian-inspired menu is entrusted to Chef de cuisine Elson Cheong, a multiple-award winning chef who has spent 10 years working in some of the finest hotels in Singapore. 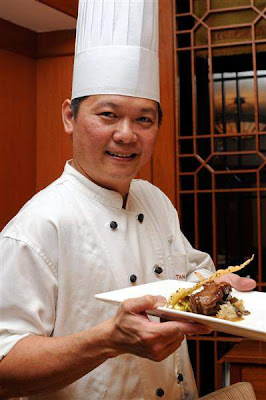 Despite his tender age, Cheong's finest hour came when he was named Best Chef in Asian Cuisine at the 2008 Food and Hotel Asia Culinary Challenge. 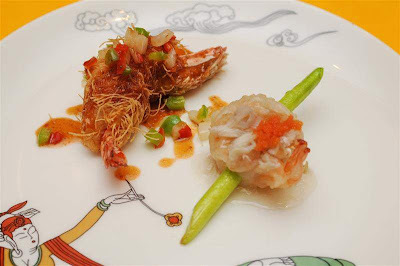 Citing Chef Otto Weibel as his mentor and the biggest influence in his culinary career, Cheong confesses he is as finicky about food quality as he is about his dishes' overall taste and presentation. 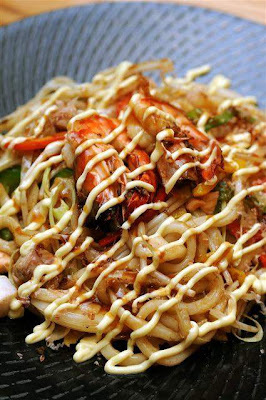 With an obvious penchant for Singaporean and Malaysian street food, the youthful culinary wizard admits he relishes the challenge of modernizing local specialities without losing out on the original flavours. 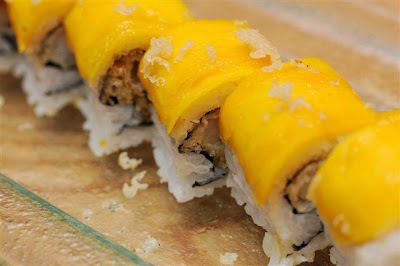 "Modern dishes is similar to modern art. You rely on the basics but one still has to find new or innovative ways to build on. The results can be pretty unusual yet interesting," he opines. 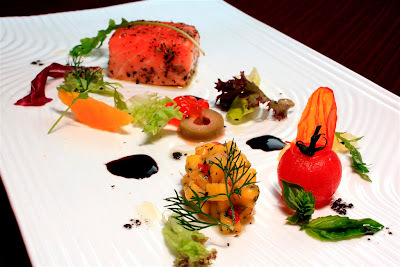 For the starter of Confit of Salmon, Mango Salsa and Crunchy Baby Salad, Cheong slow-cooked a slab of marinated salmon at 40°Celsius for 30 minutes. 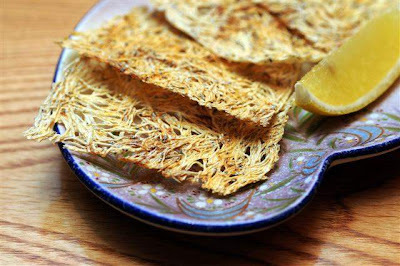 Served with warm olive oil, the fish tastes sublime; its inherent richness is well-balanced by its aromatic marinade of herbs, garlic, onion, dill, salt and pepper. Adding divergent colours, flavours and textures to the artful composition are zesty mango salsa speckled with tiny dices of red chilli, tart orange wedges and briny green olives, accentuated with splashes of fragrant vanilla oil and sweet aged balsamic vinegar. 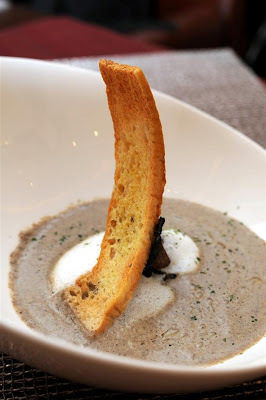 Next came the Cream of Wild Mushroom which seduces the palate with its superbly rich and creamy flavours. While the fresh button, wild shiitake and portobello mushrooms are credited for the broth's alluring earthy aroma, it is the unexpected inclusion of mascarpone that gives the soup its full-bodied thickness. 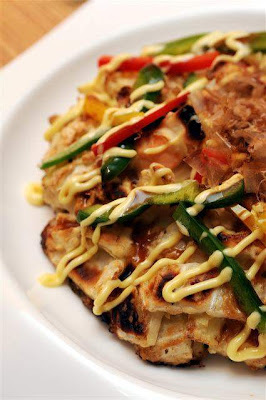 Chef Cheong reveals that instead of flour, he thickens the concoction with potato while truffle oil imbues it with a woody, musky scent. 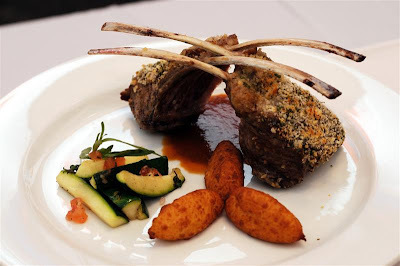 The Rack of Lamb with Feta Crust and Three Types of Caramelized Vegetables, accompanied by Lamb Jus with Shallots also come with a sumptuous surprise which turned out to be goose liver in a crispy, golden coating of breadcrumbs. Juicy and tender, the lamb remains slightly pink in the centre which is exactly the way I like it. 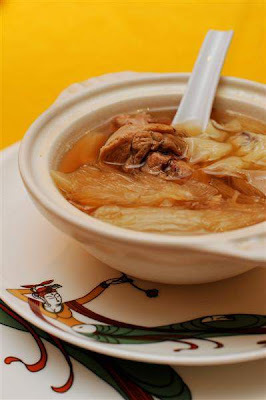 It is one of those rare dishes that manages to boast a balanced mix of strong and light flavours, brininess and sweetness intermingled with earthy accents. The chef's dessert creations are no less imaginative. 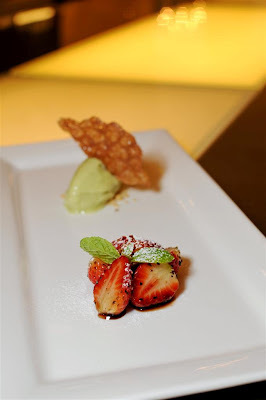 Tongue-ticklers include Avocado Sorbet, Porcini Mushroom Ice Cream or the constrasting flavours of Marinated Strawberries with Balsamico and Pepper. Do bring the curtains down on your fine meal with a pot of TWG tea here. 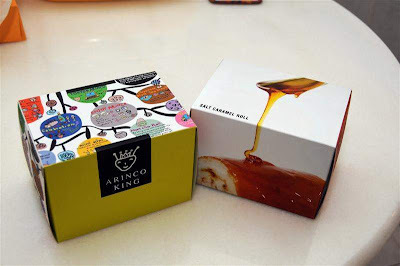 The brand’s refined selection encompasses choice blends such as Grand Wedding (black tea with white flowers and exotic fruits aroma), Moroccan Mint, Magic Flute (black tea with citrus fruits and hints of red berries), Emperor Sencha and Royal Darjeeling. I had the Creme Caramel which amazingly has all the sweet, delectable fragrances of the famed dessert minus the calories! 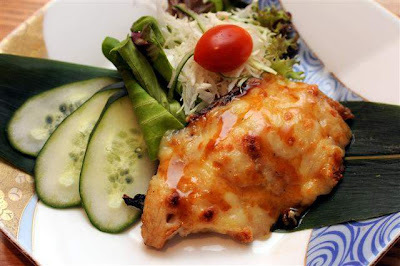 One can eat well without burning that big a hole in the pocket at Café Stelle. 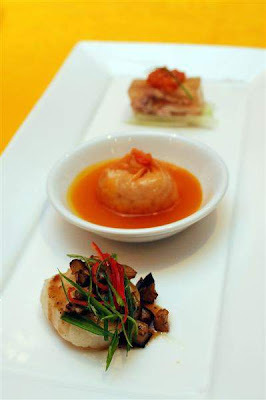 Its three-course set lunch is served at RM68 while starters start from RM18 onwards. 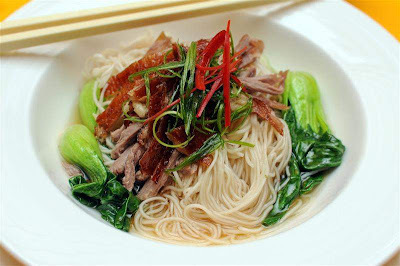 Soups range from RM17.50, sandwiches from RM19.50 onwards and pasta dishes between RM29 and RM38 each. 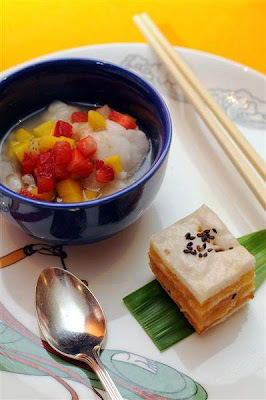 Main courses tend to hover around RM40 and RM90 while dessert is at RM15. 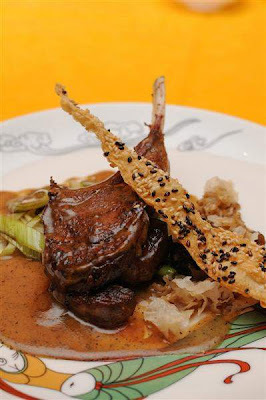 Le Bouchon – the little rustic restaurant tucked in a discreet corner of Changkat Bukit Bintang - recently underwent a change in ownership when its founder, Philippe Le Francois, decided to return to France and become a hotelier. However, all is not lost for his outlet that has quietly built up a local following for its homely French fare. 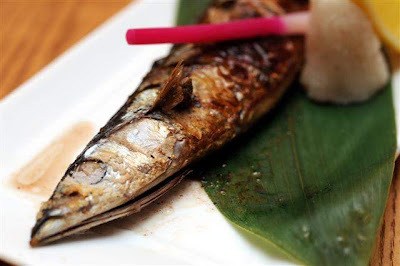 The eatery is now helmed by fellow countryman, Jerome Carrouee, a former chef who has spent 15 years in Malaysia. He has also worked in Taiwan, Penang, Mauritius and Bahrain before settling down in Kuala Lumpur. 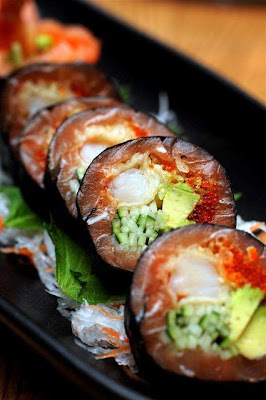 Hence it is only appropriate that the menu is given a fresh makeover - to showcase the new owner’s culinary exploits and signature specialities. Otherwise, Le Bouchon has lost none of its charming trappings of a provincial French countryside restaurant. Coming from a long family lineage of farmers, butchers and chefs, it is inevitable that Chef Carrouee became interested in food from childhood. As the new chef-owner, Carrouee has rightly chosen to return to his roots and decided to offer perennial delights that he grew up with. 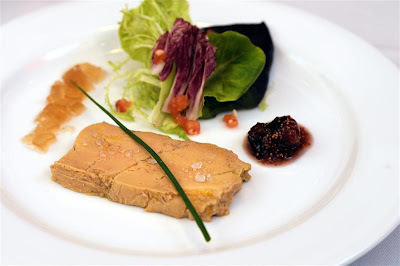 While some people are up in arms over the consumption of foie gras (goose liver), I'd rather steer clear of mixing politics with food and am not about to pass up on the appetizer of Terrine de Foie Gras Maison (RM50++) or Homemade Goose Liver Terrine served with Fig Jam and Grilled Sourdough Bread. 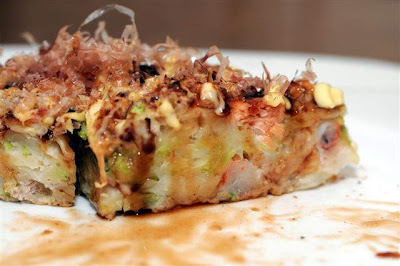 The huge slab of luxurious delicacy is simply out of this world! Spread generously on toasted sourdough, the rich and marble-smooth texture is guaranteed to hold you spellbound with its wickedly indulgent taste. 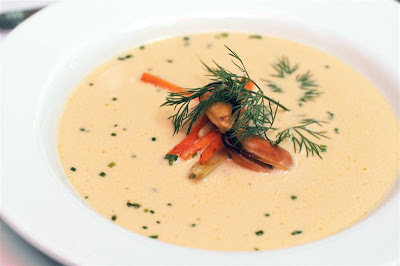 Balance your earlier extravagance with a mildly creamy yet tangy soup such as Soupe de Moules Noires au Safran et Légumes Aromatiques (RM20++). Suffused with the heady aroma and brilliant yellow of saffron (the world’s most expensive spice), the simplicity and delicate taste of the Black Mussels and Saffron Soup with Aromatique Vegetables are enough to warm the cockles of your heart. Those with a penchant for fish will find Filet de Morue Rôti au Sirop d’érable et Piment, Asperges Vertes à l’ail, Beurre Blanc de Betterave (RM62++) a noteworthy catch. 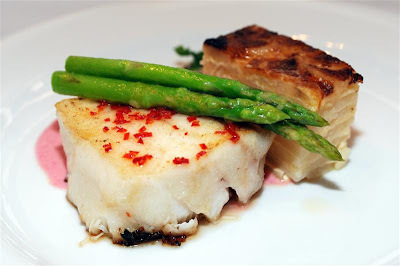 The Roast Cod with Chilli-Maple Glaze accompanied by Green Asparagus with Garlic and Beetroot Butter Cream Sauce veer dangerously close to being cloying but the piquant chilli-maple glaze helps tremendously to temper the overall richness. 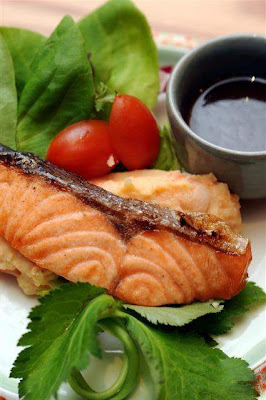 If you’re out on a dinner date, this dish’s baby pink sauce will certainly add to the romantic quotient. 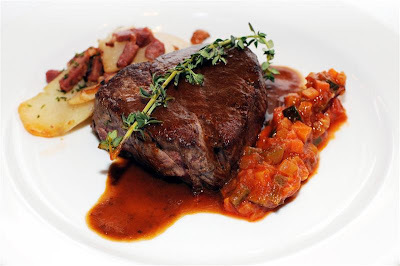 Steak and potatoes lovers can relish Pavé de Bœuf Rôti , Sauce Bordelaise, Ratatouille et Pommes Sautées aux Lardons de Canard Fumé (RM98++) or Roast Beef Tenderloin with Bordeaux Wine Sauce, Ratatouille Vegetables and Sautéed Potatoes with Smoked Duck Bacon. 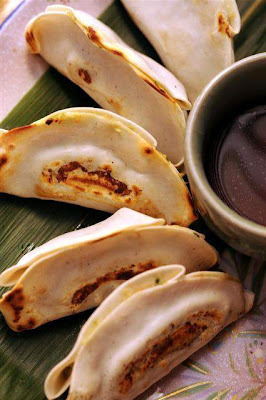 Supremely tender and accompanied by an earthy red wine sauce, this speciality should give you no cause for complaint. Special mention must be made of the duck bacon which bears deliciously smoky and briny hints similar to that of real bacon. 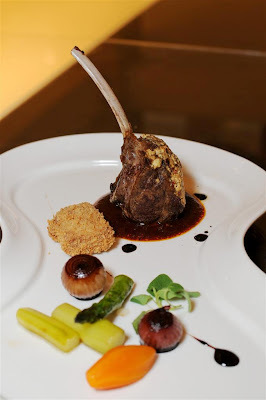 Taste-wise, it is closely rivaled by the delectable Carre d’Agneau à la Croute de Fromage de Chèvre, Courgettes à la Fleur de Thyme, Pommes Dauphines épicées, Sauce au Cabernet Sauvignon (Rack of Lamb with Goat’s Cheese Crust, Roasted Zucchinis with Thyme flowers, Spiced Dauphine Potatoes and Cabernet Sauvignon Sauce, RM82++). 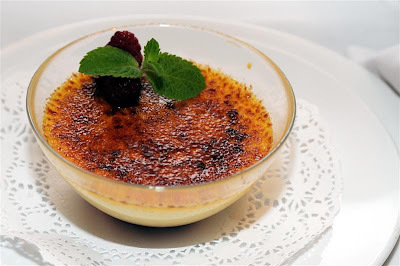 Cap off your dining jaunt here with the classic French dessert of Crème Brulée aux Framboises (Crème Brulée with Raspberries, RM18++). C'est magnifique! Can't remember the last time I had afternoon tea in a hotel. So when my best friend said we should have a belated birthday celebration for me, both of us were pondering where to go. After chancing upon Le Meridien's promo, we both agree the Conservatory would be worth checking out. We were there before the witching hour but the waitstaff offered to serve us tea as the food was still being prepared. So I ordered Super Sencha while my friend opted for mochacino. The ambience in the Conservatory certainly didn't live up to its name - overall it was a tad gloomy and we were mystified how come the area nearest to a row of tall French windows were considered prime seats in the house. The tea menu consists of two separate sets, cheekily named This and That. Besides the raisin and apple scones (still can't beat those from Delicious or The Tea Pot Cafe), there was a square of hazelnut mousse-type cake (delicious! ), a mini tartlet and another square of phyllo pastry filled with mixed nuts (both tasted a tad dry), a mini sliver of vanilla and sour cherry roulade (passable) and a square chocolate case filled with vanilla mousse and raspberry sauce (good). Honestly, we had a hard time recalling the various savoury and sweet morsels for both sets as the waitstaff kept taking away our menu. Perhaps they're afraid of it falling into competitors' hands?!! 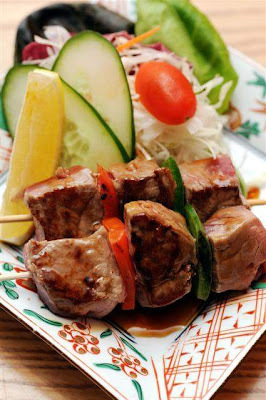 The above selection shows a skewer of chicken satay in Thai red curry sauce, an oyster shooter in zingy tom yam, half a mini burger with grilled lamb and caramelised onion and green tea soba with two slivers of Wagyu beef. Personally I think some of the tidbits would have been tastier had they been served piping hot. Alas it was not to be but we still devoured everything anyway. This set comprises the popular Indian sweet - gulab jamun, an unexpectedly fudgy chocolate cake, a pink raspberry macaroon (yummy! ), an interesting macha (green tea) slice with crumbed almond base and another dainty square of cake that tasted like a cross between coffee and chocolate. All in all, the afternoon was a hit-and-miss affair. Service was inconsistent at first - we tried hard to catch the staff's attention but after we had called for a second round of tea, they finally caught on and conscientiously refilled our percolators without being asked. This was another bone of contention for me as I recall the Regent KL had the best tea service with proper Royal Doulton tea pots and cups no less. There were other little touches too that made their afternoon tea a truly classy affair - white starched linen napkins, a fine tea strainer on the side, tea brewed from real tea leaves and classic English-style morsels like cucumber sandwiches and rich fruit cake reminiscent of Enid Blyton's delightful stories. Ah, those were the days.